"Monuments were built in memory of their kings. They were known as pyramids. Besides these, archaelogists have discovered temples, palace complexes, etc. In the initial stages, dried bricks made of clay were used for the construction of buildings. Later, square blocks of stone began to be used, Gradually, granite began to be used for constructing the tombs, palaces etc." The writings in this textbook reminds me of the Mohan Lal film in which Mohanlal who is appointed as teacher in a rural school answers to a student who asks him "Sir, what is the English word for ഉപ്പു മാവ് ?" and the teacher replies "Salt Mango Tree". What sort of English writing is this? 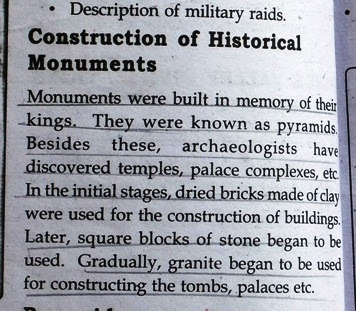 The paragraph starts with "Monuments were built in memory of their Kings" (Whose Kings?) 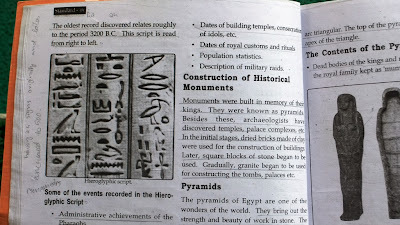 Before giving description of the pyramids, the author is jumping around talking about the building material used. He uses plenty of etc.etc. to conceal his ignorance. 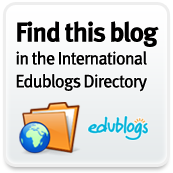 What is the significance of square blocks of stone? The ideas are not coherent. A good high school student who wins an Essay writing competition even at the District level, writes better than this.The textbook writer seems to be in a hurry to present his ideas in his own poor English and go away. The educational administrators of the textbook department have not got these textbooks verified by experts to bring contents of high quality to students. This is only a small portion I have taken as an example. 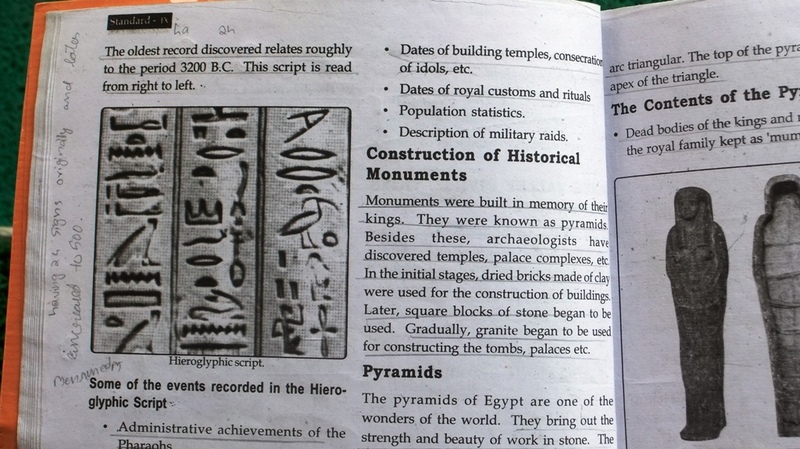 The whole textbook is rubbish. The textbook writer is not fit for this job. At least he could copy the contents from Wikipedia; this would be far better. Their should be a quality control mechanism to at least have a review of the contents before it is sent to print. The teachers and educational administrators are drawing hefty salaries with all sorts of perks (it would be at least 5-10 times what their counterparts get in the private and self financing institutions) but they are producing such shabby, substandard works.